We are currently sitting at a pretty nice library in Newport, Oregon...about half-way between Washington State and California. We ended up taking a round about way to the coast once we left Vancouver Island. We took a ferry to Port Angeles, Washington and headed east for an unplanned visit to Seattle. From Seattle we headed south-west until we finally hit the Pacific Coast at Astoria, Oregon....and now the road will be hugging the coast all the way to San Diego. I think that we are still adjusting to the highly populated USA, and the hoards of vehicles and people along this coastline. But luckily the endless beaches and spectacular views distract us from capitalism at its best (?). There are certainly no shortage of places of buy groceries and fill up our water bottles, but finding a free place to camp is a new and special kind of challenge. We have also found some decent places to camp down abandonned roads, in a model airplane airfield, and on the side of cliffs. Although, I sometimes want to give up and stay at a campground Glenn is vey good at persisting and looking for free and interesting places to stay...in his words "it makes it feel more like we are explorers, than tourists"
We made an unplanned side trip to Seattle and took the day off there exploring the city. My godmother Diana is currently staying there and we wanted to see her. As it turned out we were put up by Diana's ex husband Jerry in his Seniors Centre... It is pretty high on the list of the most interesting places that we have stayed. We took our meals with all of the residents and got a pretty good feel for life in the centre.... I think that we also sparked some curiosity among the residents.... But all in all is was a wonderful visit with Diana and Jerry! The Oregon coast is pretty stunning. There is a turnoff for a beach about every 10 km or less...and they are the kind of sandy beaches that make you want to run around in bare feet and dive into the ocean....but the water is still pretty icy up here. It is all the more stunning becuase of an almost constant fog that hovers .... Some areas are a little clearer ....but usually the fog sits around in the forests near the beaches and it all has an incredibly magical feel. For me, this trip has been really interesting becuase my grandparents lived in Oregon, and as a child we drove this coast line more times than I can count...and it has been pretty neat to cruise along and have little memories sparked here and there.... The bicycle pace is perfect for this. Oregon also has quite an amazing infrastructure for cyclists set up. Good wide shoulders, lots of signage, and even the tunnels have a special button for cyclists to press which lights up a sign for drivers letting them know cyclists are in the tunnel. Pretty cool. 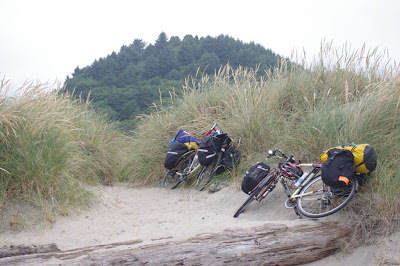 And, although we have only made use of a state park once (because we are explorers, not tourists :) ), they are a pretty sweet deal for cyclists to camp at...only $5 a person....showers included! Most parks even have a special area for 'hiker/biker' sites. Since we are so often complaining about head winds.... Let us proclaim with joy that the prevailing wind along the US west coast comes from the north.... THANK YOU WIND....at last you are being very very generous!!! Well, my knee continues to improve. There's hardly any swelling anymore and I can bike and walk normally now. Occasionally I am aware of it if I'm walking downhill or something, but fortunately it seems to be making a full recovery.